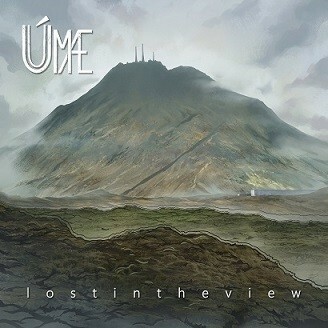 ""Lost In The View" is a beautiful first album, highlighted by a list of renowned guests, which confirms the quality of this new band that is Umae." Umae has all the characteristics of an atypical group. In February 2017, three men meet at a festival. Despite their different nationalities, they decide to found a band: Umae. Anthony Cliplef (guitar, vocals) then go on a trip to Iceland, the country of the singer and guitarist Guðjón Sveinsson, and the duo begin working on songs sent in the shape of demos to Samy-George Salib, who added his drums. If the band is then formed, they won't be alone to work on their album... Look at the list of guests! Eric Gillette (Neal Morse Band), Conner Green (Haken), Adam Holzman (Steven Wilson) and John Wesley (Porcupine Tree) play on the twelve tracks on the album. And the album was mixed and mastered by Jens Bogren himself. After the soothing instrumental "Recrudescence", reminding the late Unitopia, it is time for "Turn Back Time" to start. Anthony Clipef said he was influenced by "The Whirlwind" from Transatlantic when he wrote this long song ten years ago. This track is undoubtedly one of the highlights of the album, with its well-directed progression, its theme at the beginning and end of the song, its emotionally rich guitar solos reminiscent of those of Dream Theater's John Petrucci however without any demonstration. 'Echo' is following - another single released before the album's release - in which the group adds a jazzy dimension and a catchy refrain well found in a more condensed and immediate format. We also find beautiful progressions on the very jazzy "Onerous", some progressive metal with a math rock tendency in "Losing Grip", a solo and bewitching piano on "By Myself", proving that this Umae is already very versatile. The nugget of the disc comes at the end of the journey, with the sumptuous "Drift". The song is simple, but so well done! The two-voice chorus offers well-sensed yet unusual chord progressions. At the time of the finale, punctuated by an excellent saxophone solo, we even approach the stratosphere and to grandiosis. Apart from these pieces, the quality is not always constant. After a good start, the interest fell back somewhat in the second part of the track 'Onerous' with its instrumental atmosphere that was a little too long. In the same vein, 'By Myself' offers some very good ideas, with an interesting side of The Pineapple Thief and a most mysterious atmosphere but the song could have a few sections cut to revitalize its listening. A number of tracks are rather pleasant ('Running Away','Hold On','Shame') but do not have the qualities of the tracks mentioned above. We will still end on a good note with a beautiful guitar solo crowned with a symphonic atmosphere on "Let Go" which closes the opus. For a first album, "Lost In The View" is nevertheless encouraging and promising. The presence of five-star guests will have given the group a considerable visibility in the progressive sphere, a deserved visibility that should attract the curious and help the group to build an audience. Now, let's wait for the second album to confirm!